Get all the style and performance of a full dressed touring bike at a surprisingly affordable price. 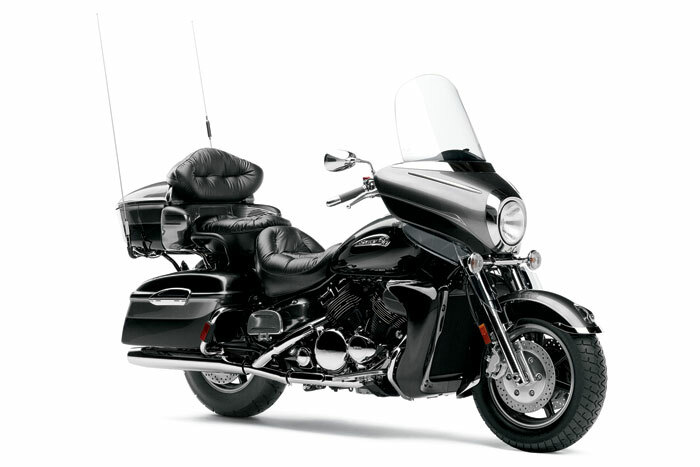 The 2013 Yamaha Royal Star Venture S features classic weather beating bodywork and lots of touring amenities. It’s guaranteed to turn heads. Did we mention the 5-year warranty too? Venture from Coast to Coast. A super smooth 1298cc V-Four liquid cooled powerplant wrapped in a high tensile steel frame built to carry two people and plenty of gear in ultimate two wheel comfort. 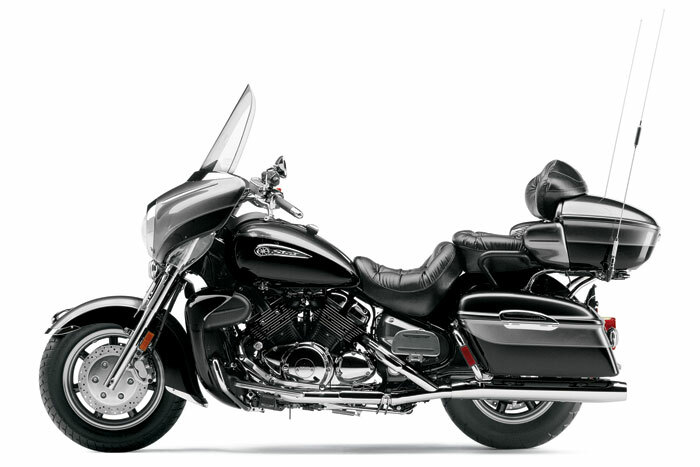 When it comes to seeing North America in detail, there’s no better way to do it than by riding a 2013 Yamaha Venture. The Royal Star Venture S, a classic touring bike that turns every head on the block with its sleek sophistication and classic good looks. Plus all the amenities and long distance comfort you would expect on a touring motorcycle. We’ve added plenty of chrome to create the Royal Star Venture S. It’s got the eye-popping style and the smooth performance of a luxury touring bike, with two very appealing added features: a surprisingly low price tag and a 5-year, unlimited mileage warranty. engine and front end chrome accents. 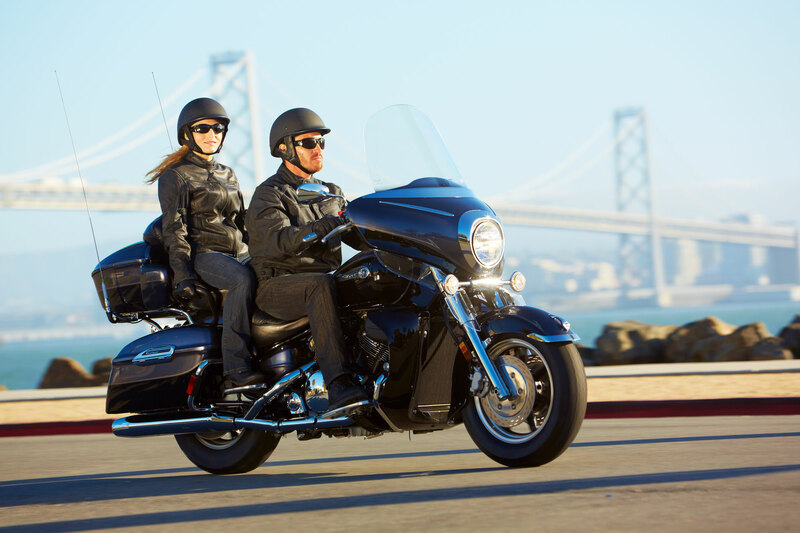 Industry’s premier rider support package includes a five-year, unlimited mileage warranty and 24-hour roadside assistance program. •1,294cc, liquid-cooled, DOHC, 16-valve, V-4 powerplant produces class-leading power – 98hp and maximum torque of 89 ft-lb @ 4,750 rpm – for excellent touring performance. •4 valves per cylinder head design ensures maximum breathing efficiency for great engine performance. •Four Mikuni BDSR 32mm carburetors with TPS deliver seamless throttle response. •Each carburetor features a single 15-watt heater to ensure consistent fuel/air delivery under varying temperatures. •Huge air box capacity provides exceptional airflow to help boost both torque and power. •Dual intake system enhances performance without sacrificing fuel tank capacity. •Large-capacity radiator ensures superior engine cooling for maximum efficiency. •Single-axis, internal engine counter balancer reduces engine vibration for maximum rider and passenger comfort. •Wide-ratio, 5-speed transmission with 5th gear overdrive reduces engine rpm at highway speeds for smooth, relaxed touring. •4-into-2 exhaust system puts out a throaty exhaust note and creates a long, low profile that’s easily customizable. •Maintenance-free transistorized coil ignition (TCI) provides a precise timing curve at all rpms for instant engine response and fast, sure starts. •Air induction system (A.I.S.) reduces harmful CO and HC emissions. •Spin-on type oil filter means fast, easy oil changes. •Easy-to-use heel-toe shifter highlights the classic retro design. •Numerous chromed engine parts highlight pride of ownership and attention to detail. •High-integrity, double-cradle steel frame with solid engine mounting and 29° caster angle delivers responsive steering and excellent handling. •Long 1,705mm (67.1″) wheelbase provides great rider control and excellent stability. •Long wheelbase also creates exceptionally roomy ergonomics for maximum rider and passenger touring comfort. •Air-adjustable, 43mm front fork with 140mm (5.6″) of wheel travel smoothes out the bumps and can be adjusted for varying load capacities. •Air-adjustable, link rear suspension features a vertically mounted single shock for that classic hardtail look and outstanding long-distance ride quality. Rear wheel travel is 105mm (4.1″). •Air adjustability allows the rider to adjust rear suspension preload to match load and road conditions. •Dual 298mm front discs are squeezed by twin piston calipers while the huge 320mm rear disc utilizes a four piston caliper to provide strong, linear stopping power. 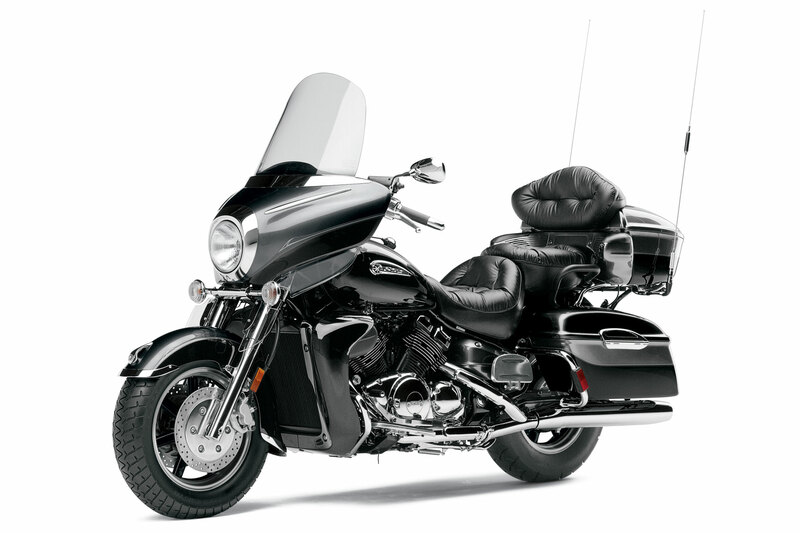 •Wide, fork-mounted fairing with wind deflectors and frame-mounted lower cowlings offer outstanding wind and weather protection. •Full-sized, floating-type rider and passenger floorboards reduce vibration and are positioned for optimal long-distance comfort. •Easy-to-reach, 1-inch, rubber-mounted handlebars reduce vibration. •22.5-litre fuel tank with low-fuel warning light ensures outstanding long-distance touring range. 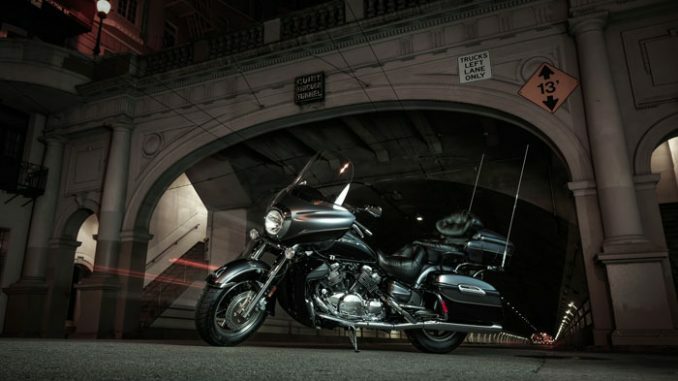 •Large, powerful 12V 60/55-watt halogen headlight maximizes nighttime visibility while cutting a stylish profile. •Remote adjustable headlight aiming with conveniently located control helps compensate for changes in load. •Vintage-style instrument console features: digital speedometer, odometer, dual tripmeters, fuel reserve tripmeter, clock and fuel gauge. •Convenient electronic cruise control system. Switch is located on right handlebar for ease of use. •Clarion AM/FM cassette stereo features automatic volume control (AVC), 18-FM presets, 6-AM presets, covered cassette deck and remote controllers for rider and passenger. There is a front auxillary plug-in for an MP3 player. 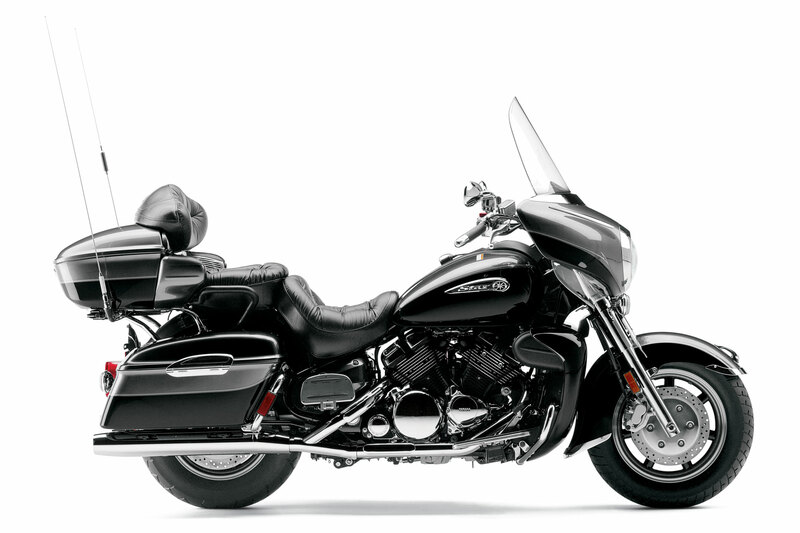 •Huge, 57-litre rear trunk with easy, one-touch opener can hold two full-faced helmets. •Colour-matched, hard saddlebags feature handy, one-touch openers and offer 35-litres of storage per bag. •Low-maintenance, 18 amp sealed battery ensures easy, reliable starting. •Self-canceling turn signalswith stylish clear lens. •Incomparable Star fit and finish includes flawless paint with extensive chrome and brushed stainless steel accents, and deep valanced steel fenders. •Ignition switch, with integrated steering lock, and accessory position is mounted at the front of fuel tank for extra convenience. •Chrome engine guards, fender trim and 3-D Venture front fender mascot highlight unparalleled styling and attention to detail.